Having built a highly credible reputation masterminding traditional chopsocky action at Shaw Brothers, Lau Kar-leung gets the opportunity to wrestle with a contemporary setting for this Hong Kong actioner. The result is a gritty crime film which is occasionally absurd but always entertaining. Reckless, slang-talking CIA officer Chow Yun-fat is teamed with blue-collar kung fu whiz Conan Lee to sniff out the Triad perpetrators of a giant coke ring, and an informant’s sister is their only lead. 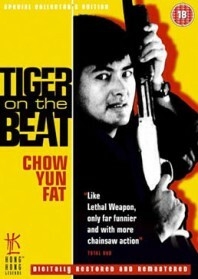 A brash performance from Chow Yun-fat is hammy but likable, while Conan Lee’s bland cop buddy provides the film’s muscle. Lau brilliantly adapts his choreography to create a new style of on-screen action more suited to an urban environment, although he still leaves room for the occasional kung fu tribute. Shaw regulars Ti Lung, David Chiang and Gordon Liu are cast in pleasing support roles, and the fights are handled with expert poise, even during the crazy finale: a superb, only-in-Hong-Kong combat sequence in which Conan Lee and Gordon Liu battle it out with chainsaws. This offbeat number has something for everybody.